With built-in Fax and a 20 Sheet ADF the PIXMA TR7520 is ready for any job. Intuitive control with an effortless User Interface & 3.0" LCD Touchscreen. Easily print your photos right from your SD Memory Card. The PIXMA TR7520 fits into almost any space with its Sleek Compact Design. A home office printer should make getting work done easier and the PIXMA TR7520 does just that. It's made to handle large workloads efficiently from printing, scanning and faxing documents quickly. It's ready to print sharp text documents and great looking photos thanks to a quick 5-Colour Individual Ink System, and has both a front paper cassette and rear paper tray. Not only is the PIXMA TR7520 quick it's also connected, you can easily print from all your devices through Wi-Fi, Bluetooth, or even the Cloud with the use of the 3.0” LCD Touchscreen. 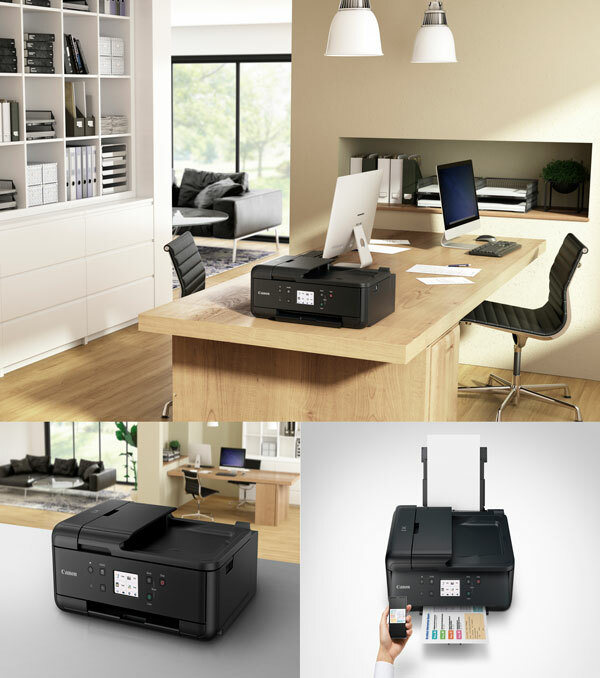 With the PIXMA TR7520 you'll see why it's the perfect home office printer that's just the right size. Designed to meet all your needs, from scanning and faxing, a 5-Colour Individual Ink System for great looking documents and photos and plenty of connectivity options – the PIXMA TR7520 has you covered. Connect your smartphone, tablet and all your favourite devices with ease! Print hassle free – whether from the Cloud, through Bluetooth, from social media or on the go! The PIXMA TR7520 is the compact Wireless Home Office All-In-One that fits perfectly anywhere in the home or office, is simple to use, and delivers outstanding results every time. With intuitive features like the 3.0” LCD Touchscreen, 20 sheet ADF and Auto Power On/Off, it’s clear to see why the PIXMA TR7520 makes printing, copying, scanning and faxing quick and easy.